For the third year, admission is free to Cranbrook Gardens through October 31, 2017, courtesy of its sponsors. The gardens are open daily from 9:00 am to 5:00 pm for self-guided visits. Spanning 40 acres around historic Cranbrook House, the former home of Cranbrook’s founders, George Gough and Ellen Scripps Booth, Cranbrook Gardens is known for its formal gardens featuring fountains, statuary, lakes, streams and extensive plantings. Highlights include the Sunken Garden, Herb Garden, Bog Garden, Native Plant/Wildflower Garden, Reflecting Pool Garden, and Sundial Garden. 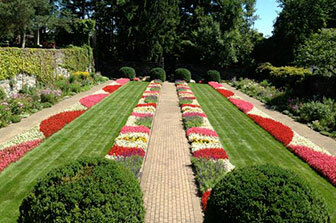 The Sunken Garden, a formal garden surrounded by fieldstone walls, was originally established by the Booths as a vegetable garden. They used the crop to feed the people living and working on their estate a century ago. The Booths lowered the garden to extend the growing season. In later years, the Booths moved the vegetable garden to another location and transformed the original space into a flower garden. Today, Cranbrook House & Gardens Auxiliary’s captivating layouts for the Sunken Garden attract thousands of visitors each year. Since there is no cost to enter the grounds, guests are encouraged to visit the Sunken Garden and all the gardens often to discover firsthand how they evolve from spring through fall. Although the gardens are free, tours of Cranbrook House and special events require paid admission, and donations are always welcome. All proceeds help support the preservation of Cranbrook House & Gardens, a National Historic Landmark. For more info, click here.